"Biomechanics is the study of the structure and function of biological systems by means of the methods of mechanics." Hatze H (1974) The meaning of the term biomechanics. To support this argument, Hatze illustrates the difference between Biomechanics and the application of Mechanics, with an example of a javelin throw: studying the mechanics aspects of the javelin flight trajectory (use existing knowledge about aerodynamics and ballistics) vs. studying the biomechanical aspects of the phase before the javelin leaves the thrower’s hand (there are no established mechanical models for this system). A good knowledge of Mechanics is a necessary condition, but not sufficient!, to have a good knowledge of Biomechanics. Although the term Biomechanics may sound new to you, it's not rare that people think the use of methods outside the realm of Mechanics as Biomechanics. For instance, electromyography and thermography are two methods that although may be useful in Biomechanics, particularly the former, they clearly don't have any relation with Mechanics; Electromagnetism and Thermodynamics are other branches of Physics. Even seeing Biomechanics as a field of Science, as argued by Hatze, it's also possible to refer to Engineering Biomechanics considering that Engineering is "the application of scientific and mathematical principles to practical ends" [The Free Dictionary] and particularly that "Engineering Mechanics is the application of Mechanics to solve problems involving common engineering elements" [Wikibooks], and, last but not least, that Biomedical engineering is the application of engineering principles and design concepts to medicine and biology for healthcare purposes [Wikipedia]. Mechanics is a branch of the physical sciences that is concerned with the state of rest or motion of bodies that are subjected to the action of forces. In general, this subject can be subdivided into three branches: rigid-body mechanics, deformable-body mechanics, and fluid mechanics (Hibbeler, 2012; Ruina and Rudra, 2015). (Classical) Mechanics is typically partitioned in Statics and Dynamics (Hibbeler, 2012; Ruina and Rudra, 2015). In turn, Dynamics is divided in Kinematics and Kinetics. This classification is clear; dynamics is the study of the motions of bodies and Statics is the study of forces in the absence of changes in motion. Kinematics is the study of motion without considering its possible causes (forces) and Kinetics is the study of the possible causes of motion. Nevertheless, it's common in Biomechanics to adopt a slightly different classification: to partition it between Kinematics and Kinetics, and then Kinetics into Statics and Dynamics (David Winter, Nigg & Herzog, and Vladimir Zatsiorsky, among others, use this classification in their books). The rationale is that we first separate the study of motion considering or not its causes (forces). The partition of (Bio)Mechanics in this way is useful because is simpler to study and describe (measure) the kinematics of human motion and then go to the more complicated issue of understanding (measuring) the forces related to the human motion. Anyway, these different classifications reveal a certain contradiction between Mechanics (particularly from an engineering point of view) and Biomechanics; some scholars will say that this taxonomy in Biomechanics is simply wrong and it should be corrected to align with the Mechanics. Be aware. Movement science will be one of the most important and most recognized science fields in the twenty-first century... The future discipline of movement science has a unique opportunity to become an important contributor to the well-being of mankind. Nigg BM (1993) Sport science in the twenty-first century. Journal of Sports Sciences, 77, 343-347. And so Biomechanics will also become an important contributor to the well-being of humankind. At the university level, the study of Mechanics is typically done in the disciplines Statics and Dynamics (rigid-body mechanics), Strength of Materials (deformable-body mechanics), and Mechanics of Fluids (fluid mechanics). Consequently, the study on Biomechanics must also cover these topics for a greater understanding of the structure and function of biological systems. The Biomedical Engineering degree at UFABC covers these topics for the study of biological systems in different courses: Ciência dos Materiais Biocompatíveis, Modelagem e Simulação de Sistemas Biomédicos, Métodos de Elementos Finitos aplicados a Sistemas Biomédicos, Mecânica dos Fluidos, Caracterização de Biomateriais, Sistemas Biológicos, and last but not least, Biomecânica I & Biomecânica II. How much of biological systems is in fact studied in these disciplines varies a lot. Anyway, none of these courses cover the study of human motion with implications to health, rehabilitation, and sports, except the last course. This is the reason why the courses Biomecânica I & II focus on the analysis of the human movement. Biomechanics progressed basically with the advancements in Mechanics and with the invention of instrumentations for measuring mechanical quantities and computing. The development of Biomechanics was only possible because people became more interested in the understanding of the structure and function of biological systems and to apply these concepts to the progress of the humankind. Aristotle was the first to have written about the movement of animals in his works On the Motion of Animals (De Motu Animalium) and On the Gait of Animals (De Incessu Animalium) [Works by Aristotle]. Although Aristotle's contributions were invaluable to humankind, to make his discoveries he doesn't seem to have employed anything similar to what we today refer as scientific method (the systematic observation, measurement, and experiment, and the formulation, testing, and modification of hypotheses). Most of the Physics of Aristotle was ambiguous or incorrect; for example, for him there was no motion without a force. He even deduced that speed was proportional to force and inversely proportional to resistance [Book VII, Physics]. Perhaps Aristotle was too influenced by the observation of motion of a body under the action of a friction force, where this notion is not at all unreasonable. "Males have more teeth than females in the case of men, sheep, goats, and swine; in the case of other animals observations have not yet been made". Aristotle The History of Animals. "Le proporzioni del corpo umano secondo Vitruvio", also known as the Vitruvian Man, drawing by Leonardo da Vinci circa 1490 based on the work of Marcus Vitruvius Pollio (1st century BC), depicting a man in supposedly ideal human proportions (image from Wikipedia). 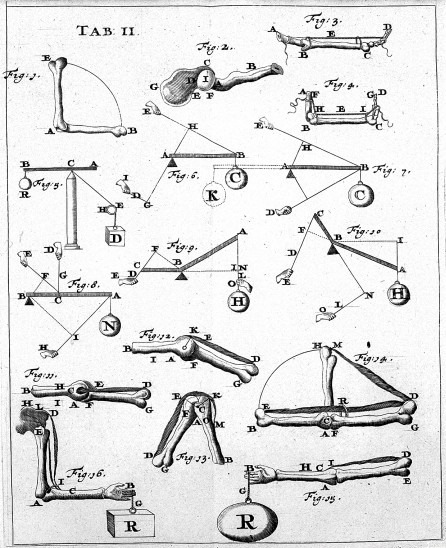 The father of biomechanics; the first to use modern scientific method into 'Biomechanics' in his book De Motu Animalium. Proposed that the levers of the musculoskeletal system magnify motion rather than force. Calculated the forces required for equilibrium in various joints of the human body before Newton published the laws of motion. Excerpt from the book De Motu Animalium. Go to Biomechanics Classes on the Web to visit websites of biomechanics classes around the world and find out how biomechanics is studied in different fields. Find examples of applications of biomechanics in different areas. Watch the video The Weird World of Eadweard Muybridge to learn about Eadweard Muybridge, an important person to the development of instrumentation for biomechanics. Think about practical problems in nature that can be studied in biomechanics with simple approaches (simple modeling and low-tech methods) or very complicated approaches (complex modeling and high-tech methods). What the study in the biomechanics of athletes, children, elderlies, persons with disabilities, other animals, and computer animation for the cinema industry may have in common and different? Visit the website of the Laboratory of Biomechanics and Motor Control at UFABC and find out what we do and if there is anything you are interested in. Is there anything in biomechanics that interests you? How could you pursue this interest? Hatze H (1974) The meaning of the term biomechanics. Journal of Biomechanics, 7, 189–190. Hibbeler RC (2012) Engineering Mechanics: Statics. Prentice Hall; 13 edition. Nigg BM and Herzog W (2006) Biomechanics of the Musculo-skeletal System. 3rd Edition. Wiley. Ruina A, Rudra P (2015) Introduction to Statics and Dynamics. Oxford University Press. Winter DA (2009) Biomechanics and motor control of human movement. 4 ed. Hoboken, EUA: Wiley. Zatsiorsky VM (1997) Kinematics of Human Motion. Champaign, Human Kinetics. Zatsiorsky VM (2002) Kinetics of human motion. Human Kinetics.